And you think my name is weird? Take a look here - some of these are so funny I actually howled with laughter! In particular I LOVED Anna Sasin. Scroll down and take a look at some of my reviews or even better yet, visit Amazon and read the reviews there. Next week is a busy one again...is it ever any different I wonder? But I hope to be able to post a little just to keep you all in the loop. There are also a variety of events planned but I don't have all the dates lined up yet. As soon as I do, I will post them here. Today I heard back from another of my readers. She raved about The Owners and openly admitted that when she had first heard about it, she had thought that it would not be her "sort of thing". But upon reading Volume I, she had become fully captivated by the story, the characters and the situations they found themselves in, so much so that she was desperate to get her hands on a copy of Volume II. Wonderful as this story was to my ears it was also rather familiar. So many people have said the more or less exact same thing to me. Indeed the appeal of the story has been likened to that of the Harry Potter books where people of all walks of life and ages have become entranced by the story. And the question that arises from this is : why if the book is so good, am I not seeing the meteoric rise of the novels that the esteemed Ms Rowling did? Is it luck? Am I missing some vital link in the chain? Have I not yet encountered the right people in my journey? I have no idea. So dear reader if you have any words of wisdom on how to get more publicity for this clearly great series...pass 'em on to me. I remain ready and waiting for all your sage advice. As you know I have been incredibly busy writing Volume VI of the Owners series. But now that I'm more than half-way through, I think it's time to finish editing my series for children aged 8-10 and finally get them out on the shelves. The Mellillia books are funny and quirky and are very different to The Owners books. But that is only part of the appeal. Writing books for children requires a certain mind-set - a way of looking at things differently from how we normally view them. It's a refreshing take on our lives as adults and I find myself smiling even as I write. With The Owners, the writing is more intense, more frenetic and I barely have time to breathe as the words hurtle themselves out of me and onto the screen. And then there is my adult book which still requires me to sit down and get on with it. This is very different again from either of the two series I have previously mentioned but is just as intense as The Owners but in a very different way. I'm coming to the close of Volume VI : Blood Sky and am feeling a little uneasy. Perhaps I should explain. As you already know, Volumes I-III have already been released but Volumes IV -VI have been deliberately held back. This is because they were all so closely linked, so tied-in together, that I wanted to release them all at once...to give the reader the fullest experience of the journey the characters must undertake. But that journey has now reached its final destination and this part of the epic tale that is The Owners, is done. I have birthed these characters, given life to them through my own blood, sweat and tears and now it is almost time to say goodbye to them and my heart quivers with fear and grief. I will miss them dearly - the sounds of their voices in my head, their easy way with one another and their solidarity in times of trouble. But most of all I will miss their willingness to share their story with me, the eagerness with which they jumped into every plot and how they filled every line with their vitality. But it is time to bring forth the new blood...the characters who will strut their stuff in Volume VII and inhabit my thoughts and dreams as much as Jack, Georgia and all the others always have. And of course, there, right at the end of the path, Little, Loni and San are waiting for me, waiting eagerly to come back and finish their part of the saga...and how can I deny them? Nothing will ever be quite the same again! I went to the cinema yesterday. Now I state that as a bald fact to ensure that you understand what an occasion that is for me, to go to the cinema to see anything! A friend of mine had gone to see the exact same film at the sitting directly before mine and had texted me to say that it was slow to begin with. This was also the view held by my viewing partner, who thought that the opening scenes and first third of the film dragged. I have to say I disagreed. Whilst I did find the exposition of the concept a little heavy-handed at times [you almost felt that they explained it in such a painfully slow way that even a learning-impeded five year old would have understood it] it somehow fit in with the quaint Britishness of the film itself. What I mean by this, is that it had neither the pace of the ideal American offering such as 24, The Bourne conspiracy films or even the speedily delivered witticisms of the average Big Bang Theory episode. But instead there was a sweet meandering to the plotline. This was only enhanced by the simply brilliant acting of Bill Nighty and the gentle but inevitable fall of the character Kit-Kat, who I found mildly reminiscent of the character Mary Steenburgen played in the tv adaptation of F. Scott Fitzgerald's Tender Is The Night. But I won't tell you more and risk spoiling your enjoyment. All I will say is if you like quirky British films you will like it. If you enjoy bitter-sweet ending you will love it and if you like your tales to have a moral at the end...well then, you will simply love it! Either way...give it a try and let me know what you think. But deliverance from sin was not an option , nor was it Denzel’s to offer. Now that she was approaching the crux of the matter, she didn’t really know where to begin. Here where she was at with her own personal knowledge? Or further back so that they could all get the wider picture. This volume is flying along and I am already on chapter 7. Don't forget you can find me at the Andromeda One sci-fi convention at The Custard Factory on Saturday, along with a whole host of other authors. I will be selling my books at a discounted rate for the occasion and will sign them for you too! Have a great weekend, whatever you are getting up to! 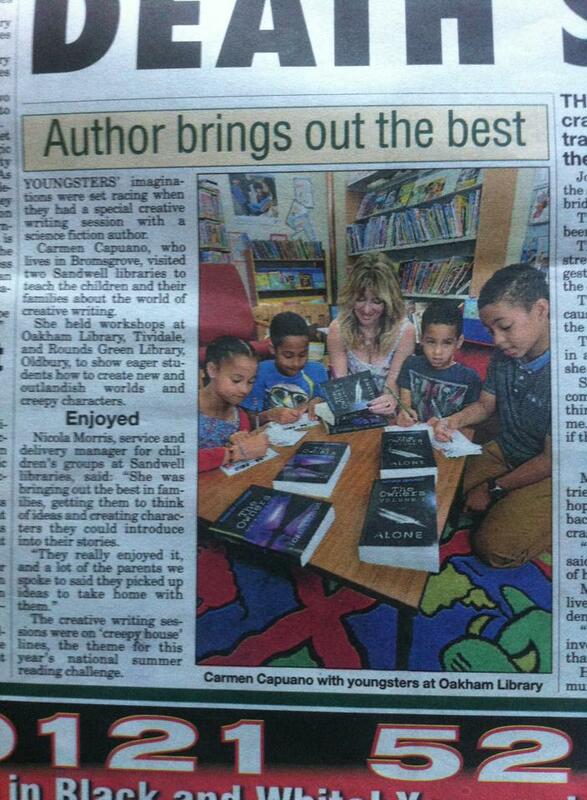 Here I am looking all authorish on the front page of a local Sandwell newspaper. I will fill you in on the details on my next blog post and also tell you about my recent trip to Scotland. Have you ever hear the saying 'don't sweat the small stuff'? It refers of course to panicking over the little things in life, rather than letting them pass over you in a gentle breeze. Well today I want to take you on a tour of that small stuff, from a very different angle. The reference to the 'small stuff' came in the form of a wedding reception I attended recently. As everyone who has ever been married knows, there is almost no end to the plans which need to be made, from the biggies such as where and when to get married, to the smaller stuff such as who sits where. And sometimes in the middle of all this, the detail can be lost. There is simply too much going on. And I am sure that for this couple there were just as many headaches to account for, as with any other couple making wedding plans. But it was in the attention to the detail of the small stuff, that they elevated their reception beyond what was the norm, turning it into an almost magical event. The ceremony was not a lavish affair nor was the venue for the reception afterwards but the couple's attention to detail was truly breathtaking. The word 'buffet' did not do this sumptuous spread of food justice. It was a feast, a banquet of foods that both in volume and scale had required not four but a veritable army of ladies to set it out. But even that is somewhat par for the course. What really set this fayre apart from all others, was that when the deserts were finally cleared away, the profiteroles, the cheesecakes and all the gateaux, the little army of helpers loaded the table once more...with £350 worth of pick-and-mix sweets for adults and children alike. Little paper bags were provided, all labelled with stickers of the bride and groom's names and scoops were set across the table, encouraging the guests to fill their little bags to the very brim. The atmosphere was no longer that of a wedding, formal and stuffy but was instead more like a fiesta or carnival. Everyone loosened up and joined in the fun. All the tables had been decorated with confetti and glittering ornaments, balloons hung from every table leg and rafter and little filigree cardboard boxes filled with chocolate, adorned the table-tops. And I can honestly say it was the best wedding reception I have ever attended [my own included]. And all because the bride had sweated the small stuff. She had paid minute attention to every detail. And it showed. Your reception was the absolute best EVER! And the fact that I got to dance, drink and be merry...well that was just the topping on my cake. Congratulations and I wish you every luck for the future! Another review has just come to my attention. It's so nice to know that my books are providing enjoyment and I can't wait to get back to writing when the kids return to school. In the meantime I am busy sorting school uniforms and shoes...a mother's work is never done! However, once I started to read it, I found that it was really about the characters and how they get through the problems in their life and I really connected with it. I would recommend this book. It is character driven and just enough different to keep you engrossed and keep you turning the pages. Ah ha! Here is a new business venture for me. I have just weighed myself and I weigh EXACTLY 8 stone 8 pounds. If you would like to know how I achieved a few pounds weight loss over the course of 10 days here are my helpful tips. 1. Go for a tonsillectomy...it will hurt like hell and you won't be able to talk but on the plus side, you won't be able to eat either. 2. Blow your oven up. Now you have nothing to cook on, [even if you did work yourself up to be brave enough to try food once more after undergoing option 1 see above]. 3. If you are tempted to eat outside of the home, just forget to bring the hospital-issued painkillers with you. That will soon put a stop to that idea. 4. Ensure that before embarking on steps 1-4 that you fill your freezer with foods that your children love but that you hate, so that cravings are reduced. 5. Should you get hungry at any time, console yourself with a large cool glass of orange juice, even though you know that your body does not react well to this and spend much of your free time in the toilet.